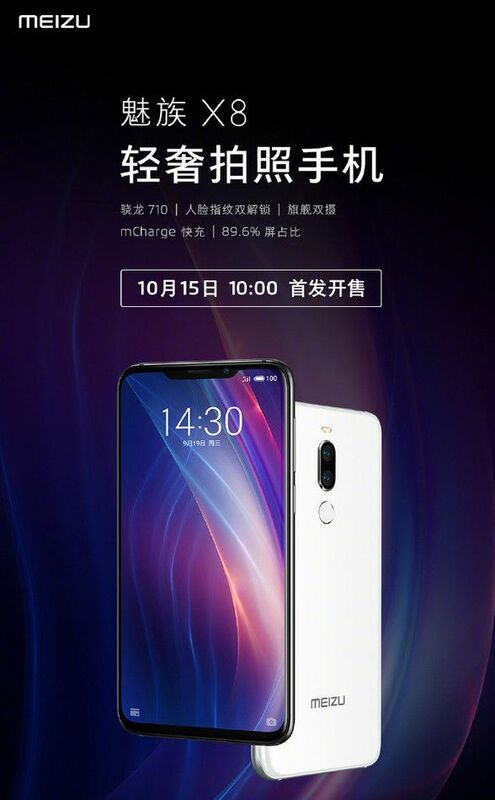 Meizu X8 Sales to Begin on October 15 with Snapdragon 710 - Playfuldroid! After launching the Meizu 16 and Meizu 16 Plus flagship phones in China in August, Meizu had launched the Snapdragon 710 powered Meizu 16X smartphone. The Chinese manufacturer had also launched Meizu V8 and V8 Pro budget-friendly smartphones and its first notched display phone, the Meizu X8 in the previous month. When the Meizu X8 had launched, the company did not confirm on its availability. Today, the Chinese company has revealed that the official sales of the Meizu X8 will begin from Oct. 15 at 10:00 AM. It will be available for buying through Meizu’s official online store and its official website. The base model of the Meizu X8 has 4 GB of RAM and 64 GB of storage and it is priced at 1,598 Yuan. The second variant features 6 GB of RAM and 64 GB of storage and it costs 1798 Yuan. The highest Meizu X8 model includes 6 GB of RAM and 128 GB of storage and it carries a pricing of 1,998 Yuan. From Nov. 1, the handset will be also available through other online retailers from China such as Tmall, JD, Suning Tesco, Gome and so on. As far as specs are concerned, the Meizu X8 features a 6.2-inch LCD display that produces FHD+ resolution and a screen-to-body ratio of 89.6 percent. At the front lies the 20-megapixel selfie camera powered by ArcSoft AI smart beauty for capturing enhanced selfies. The rear panel has 12-megapixel + 5-megapixel dual camera setup. It includes 3,210mAh battery with fast charging support.